On 21st September 2000, at around the time other European countries saw the release of "Velvet", Norway released "The Sun Never Shone That Day" to radio stations. The single was never available to buy in the shops. "The Sun Never Shone That Day" was released to German radio stations on 26th January 2001. Although this single was not available to buy in the shops, it was included in the 4-CD box set Minor Earth | Major Box which was released in Germany on 26th February 2001. The Norwegian promo release comes in a jewel case with a unique picture sleeve, the cover features a picture of a-ha sitting inside an open top car (as found towards the back of the "Minor Earth | Major Sky" album booklet). In the lower right hand side of the sleeve there is a grey bordered white box which has been subdivided into 3 sections. In the top section is the a-ha logo, while the lower sections contain the title and track time (4:39) in grey lettering. The inner sleeve and disc are light grey with a white bordered partitioned box containing white titles and copyright information. Germany: On 26th January 2001, a one track promo CD of "The Sun Never Shone That Day" was released to German radio stations. The cover is completely different to that of the Norwegian promo. The front sleeve features a darkened picture of a rear car windscreen against a yellow sky. The title and a-ha logo are printed above in white. The reverse of the sleeve features a picture of a side window of a white car in front of a light yellow sky. Track information is printed in dark lettering above. The single features a "Radio Edit" (3:30) of the song. 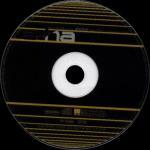 The disc itself is black with yellow stripes along the top and bottom sections. The silver a-ha logo is printed at the top of the disc, while other text is printed at the bottom, including the words "For Promotional Use Only. Not For Sale". The CD comes with a promo information sheet. There is also a two track promotional "safetycopy" which comes with a white wea text sleeve. The disc features the radio edit (3:30) plus another version (3:44). The disc has a paper white label with black titles. 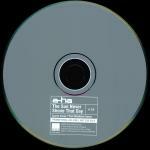 A-HA is printed a the top of the disc with the address of wea in Germany below. The two tracks are listed at the bottom of the disc and the wea logo is on the left hand side.